Posthumanos from Aleph. Image from Corvus Belli’s online store. What she cannot earn by hacking, she will get it shooting in your face. Talk about efficiency. 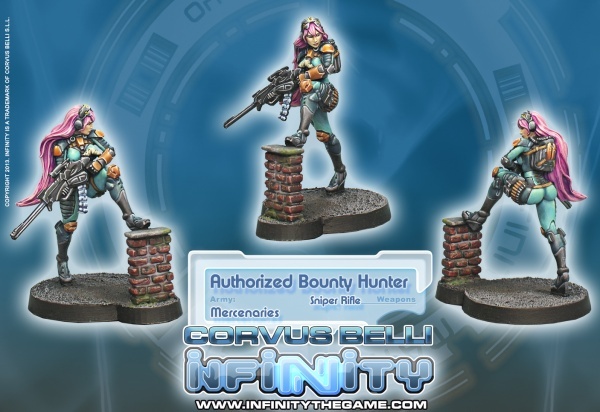 Authorized bounty hunter. Image from Human Sphere website. The only thing you’ll see from her is the air wave arround her while she shots you dead from her thermo-optical cammouflage. Hacker and sniper. A shame I cannot field both at the same time. I hope you’ve all enjoyed this conversion. Next week I’ll be talking about the upcomming Nanocional, and I’m trying to bring all my list painted for this event, but I’m not sure I’ll make it on time. I’ll show you how much I’ve painted next week.